For those of us who grew up in the seventies, Doctor Who was a transient experience, appearing on our tv screen for 25 fleeting minutes each Saturday, then gone, forever lost into the ether. There was no catch-up and no repeat, no DVD release to collect and treasure, not even a Doctor Who Magazine to help us analyse and review each story. But we were lucky, we had one great advantage that would enable us to relive each story, savour each experience. We had the Target books. The paperbacks were the essential purchase for the fan of the era, The novelisations that allowed us to replay the stories in our mind, to archive the memories. It's probably true to say that without that initial range of books, the series would not have gained such a foothold in the affection of so many people, and may not even exist today. And those books had covers. Glorious illustrations conceived by talented artists that gripped the casual browser and summed up the story inside. We loved those books, collected them, and treasured them as one of the few permanent contacts we had with the stories from the programme we loved. The covers became etched into our memories, their bright vibrant images often more enduring than the black and white flicking images from the episodes themselves. So what a joy it is to see those all so familiar illustrations in their original form displayed at the new exhibition at the Cartoon Museum in London's Bloomsbury. The exhibition features thirty exhibits, featuring artists covering stories from every era of the classic series. From Chris Achilleos we have those iconic Hartnell covers from The Daleks and The Web Planet, showing the brooding, slightly sinister first Doctor, which gave many of us our first introduction to the original. Ten pieces from the artist are featured including the epic Space War showing a snarling Ogron and the classic cover to Genisis of the Daleks, reused for this month's DWM. The later Target period is represented by Andrew Skilleter and by covers from Destiny of the Daleks, through to The Mark of the Rani, showing the Rani in full hag mode. Other artists represented include Roy Knipe, Jeff Cummins, and David McAlister, with covers as diverse as The Doomsday Weapon, showing a snarling Master through to the glinting chrome splendor of The Giant Robot. Seeing the covers in their original form, devoid of logos and titles, really allows you to appreciate the tremendous work which went into creating them. The detail is superb and the memories come flooding back. The displays take up most of the first floor of the small museum, with plenty of room to study the detail and appreciate the skill involved to create them. The collection has been put together by the current Doctor Who Brand Manager Edward Russell, a self-confessed fan of the book range, who has managed to persuade collectors from around the world to loan their precious material for the exhibition. The effort is well worthwhile and the exhibition is unique in allowing so much original material to be seen together. The exhibition is timed to coincide with the re-release of a series of the novelisations this time published by BBC Books, complete with new artwork from Chris Achilleos, some of which is also displayed. The exhibition runs for just two weeks. 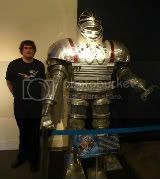 It's definitly worth a visit, not only if you are a fan of the original range, but for any Doctor Who fan who wants to experience some of the history of the show, and one part of what makes it so enduring. 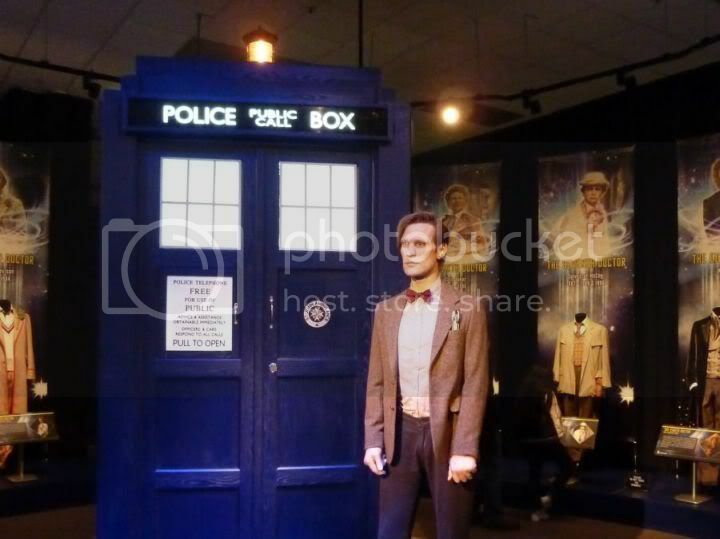 The latest incarnation of the Doctor Who Experience opened its doors to the public today. The show’s popularity was itself on view, as queues stretched down the road while fans snapped photos of a few unexpected arrivals: a Dalek, Cyberman, Silence, and Silurian mingled with the crowd and posed menacingly for pictures. There was even an official opening ceremony. A younger visitor dressed as the eleventh Doctor – complete with fez – cut the ribbon and got the show on the road. Inside, the new building is filled with lovely details. Chris Achilleos-style illustrations (presumably using Anthony Dry’s artwork) adorn the final queuing area and the café, and “Exterminate!” graphics eventually usher you out of the gift shop. Bessie sits inside the main entrance, looking every bit as resplendent, shiny and new as her box-fresh surroundings. Many fans will have visited the previous Experience based at London Olympia. This version shares much of its DNA with that earlier venture: the interactive walk-through part seems pretty much identical. Given that the Doctor Who Experience will be based in its new Cardiff home for at least five years, focusing on the Pandorica might start to seem like ancient (series) history as that tenancy progresses. Nevertheless, the series five-centric walk-through does a great job of capturing the energy, wit and feel of televised Doctor Who, featuring some great effects, spooky monsters and impressive 3D. You’ll probably never view a Dalek sucker arm in the same light. The exhibition part of the Experience is where value is really added for return visitors, as there’s a good selection of props on show here for the first time. These include the Silence spaceship (appropriately enough, lurking upstairs), the cyber conversion chamber from Closing Time, the Doctor’s cot from A Good Man Goes To War, and Let’s Kill Hitler’s antibodies. 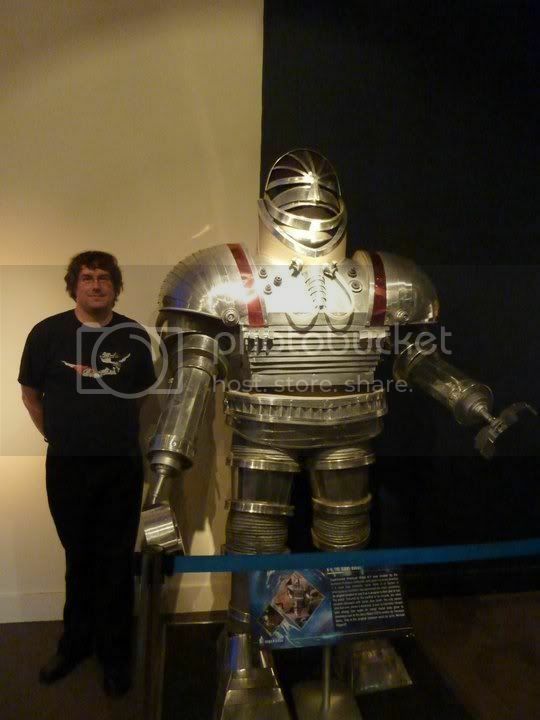 The most recent Christmas Special is also represented by items such as the Doctor’s spacesuit. But for visitors new and old alike there are some exhibits that continue to be show-stoppers; downstairs there are various Police Box props scattered between TARDIS interiors like the “Coral desktop theme” and the Junkyard version featured in The Doctor’s Wife. And the Doctor’s many costumes also form a central part of the exhibition space. 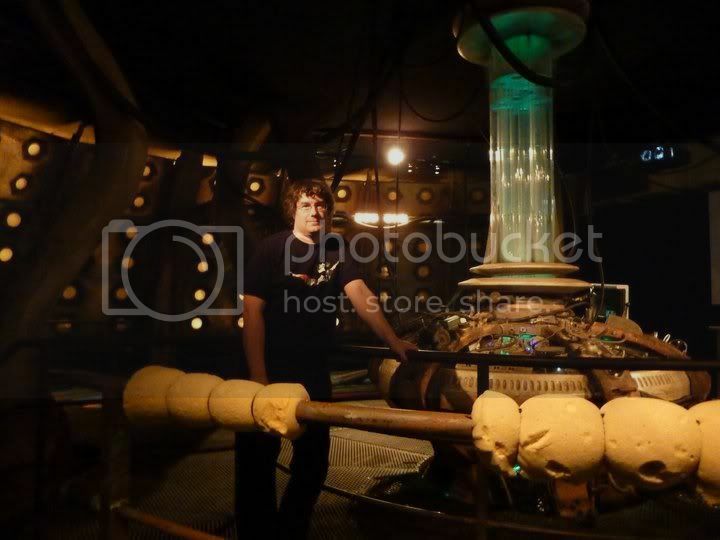 Housed across two floors, displays really have room to breathe, and you get a wonderful sense of scale and scope as you walk up the interior staircase, able to gaze down at ground-floor exhibits, and take in the Melkur and the RTD-era TARDIS alongside all the many costumes. Upstairs, Daleks and Cybermen get their own dedicated areas, and one can’t help but wonder whether Asylum of the Daleks was partly inspired by a certain showrunner witnessing different eras of Daleks lined up together in the Experience. A Zygon and an Ice Warrior also stand together, daring fans to speculate about yet more returning monsters. 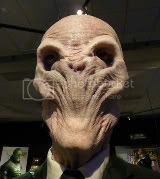 As well as exploring the sounds of Doctor Who, the upper floor illuminates design processes, using the eleventh Doctor’s TARDIS interior as a case study, and demonstrates the various stages of monster creation by focusing on an Ood. An assortment of props, among them a rug from the series six White House and a time glass from The Girl Who Waited, round things off before visitors are directed out via the gift shop. I love a little shop, and this one is well stocked with DWE exclusives (something which wasn't true when the Olympia Experience first opened). Mind you, I would've liked to see more Cardiff-specific merchandise carrying the brand new ‘Porth Teigr’ identity. Overall, this was an extremely well-handled opening day; queues seemed fast-moving, and the monster alliance outside the venue was well received by everyone. And the new venue has Doctor Who threaded right through it. At the Olympia it was only when you exited from a characterless lift that you felt you'd stepped out of impersonal corporate space and into the colourful, thrilling Whoniverse. Not so now; this is a far more unified Who experience. Even before you get into the building there’s a brilliant Police Box landing bay visible as you approach. It will apparently be lit at night, but even during the day it makes a wonderfully welcoming icon (rather like the old TARDIS entrance that used to greet visitors to the Longleat exhibition back in the day). Whether you’ve been to the DWE before, or have always wanted to go, this regenerated version is well worth a visit. Tickets are available now from doctorwhoexperience.com. Many other photos from my visit can be found on Facebook. Waking up on a dull-ish Wednesday morning meant two not-so-dull-ish things happening today: firstly, it's my birthday, hoorah; secondly, it's the day we go to the Doctor Who Experience! Olympia 2 is a strange place; unlike it's massive main companion, the building is a case of "blink and you'd miss it" - only the signs give it away, and then you have security into a plain lift to the second floor ... and suddenly as the doors open you're in a different world! 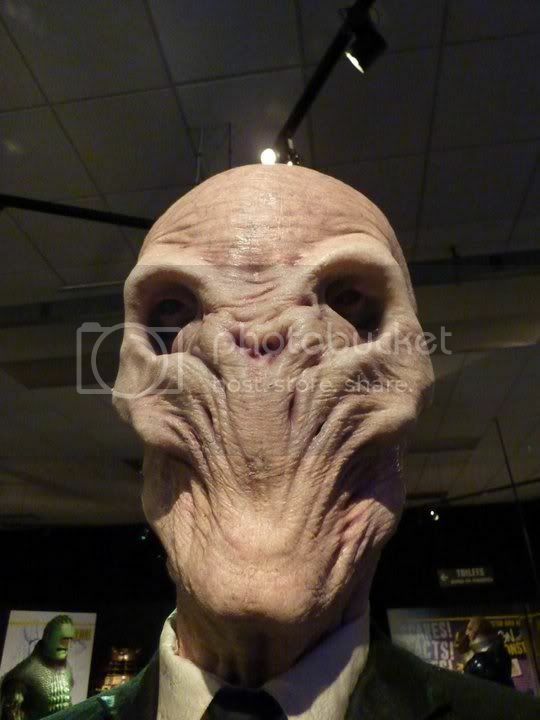 The key selling attraction of the Doctor Who Experience is, of course, the Experience itself! This takes up the first part of the visit, and is based around a loose script of the Doctor requiring assistance from the audience in order to resolve the problems faced. I'm not going to spoil things here, but essentially you'll meet up with his greatest and his scariest foes, plus the chance to pilot the Eleventh Doctor's TARDIS yourself! (well actually the kids are expected to pilot, but in a small group like ours a big kid like me gets to have a go, too!). There is also a 3D segment that beats the pants off many of the recent films of that style - Pirates of the Caribbean eat your heart out! The whole experience is perhaps a little disappointingly short in comparison to some attractions you might visit for a similar price range (the London Dungeon comes to mind here), but then of course it isn't the only part of the overall visit, there's the large exhibition to follow, too! Also, its length is comparable to episodes from the original series - your own "Mission to the Unknown", so to speak! However, it is fun and the 'passive' Doctor interaction (as portrayed by Matt Smith) was good, though mayhaps needed a bigger audience than our own group to really work effectively. Unlike London's other recent exhibition at Earl's Court where you followed a route around the exhibits, here at Olympia 2 it is much more open-plan and you can wander around at your leisure in the order you like. As you exit the Experience you do initially encounter the first ten Doctors in their respective costumes though, surrounding the latest incarnation by the TARDIS. Here you can also get your chance to appear in a (paid) photo within the Pandorica yourself via green-screen. 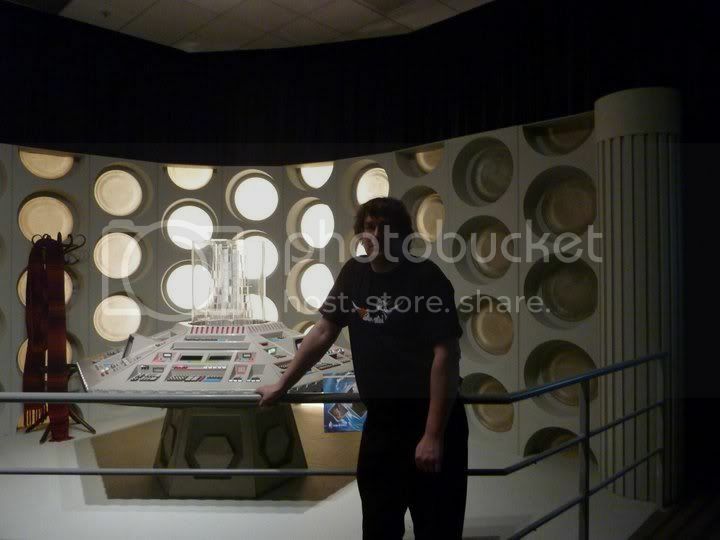 Speaking of the TARDIS, having interacted with the Eleventh's within the Experience, here in the exhibition you'll find both the complete Ninth/Tenth's "coral theme" version and the Fifth/Sixth/Seventh's partial sets, though you can't wander around the consoles, unfortunately. Also lurking in the corner is another TARDIS prop, one of the originals that's almost like an old friend (having had the personal experience of it nearly collapsing on top of me at Panopticons past - eek!). Other interactive elements include an area where you can learn to walk like the scarecrows from Human Nature/The Family of Blood or stomp like a Cyberman, taught on video by series choreographer Ailsa Berk herself. 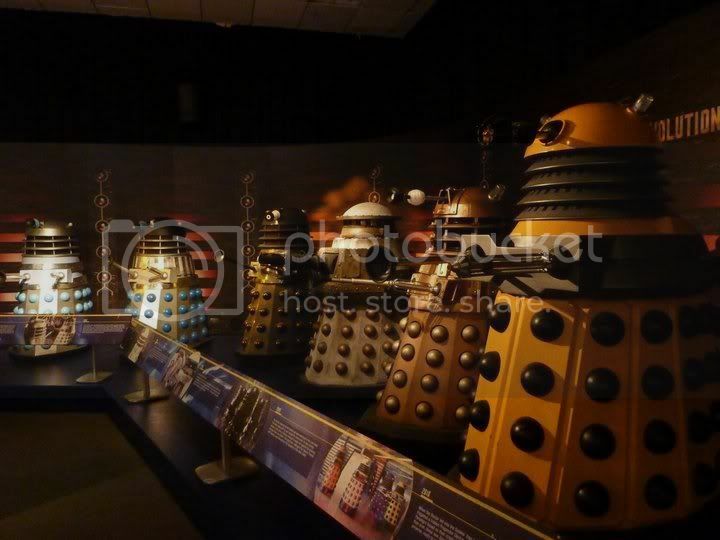 An obligatory "be a Dalek" prop (which has been around since the MOMI exhibition at the BFI in the early 1990s!). There's also a mock-up of what the BBC Wales art department looks like in all its mayhem. All in all, you can spend a pleasant hour to hour-and-a-half at the Experience, depending on how much you like to read the information presented with exhibits or watch the video presentations. It's difficult to judge if it is worth the £20 entrance fee with previous exhibitions being half the price, but then the interactive section is fun (and you can see the expense there in places), and there are discounts to be had from various sources - £15 is an average price you can find and that is reasonable in comparison with many of the other London attractions. There is plenty to interest kids and adults alike, though I feel perhaps the former will get more out of the interactive section, and the latter the main exhibition! Oh, and there's a not-so-little shop! One amusing incident on the day happened to be in the Experience, as we had a new member of staff accompanying the group to "learn the ropes". At one particularly scary (for the kids you know ...) stage, the long-term member was telling the other all about a certain scary monster and then as they went through a corridor another member of staff leapt out. I think those behind us who didn't see the event must have wondered what that blood curdling scream was all about!